Same brightness. That's actually the fundamental physics for it -- temperature of a planet is based on the balance between energy coming in (sunlight) and energy going out (thermal emission). So for an Earth analogue planet, it better be receiving Earth-like intensity of sunlight to have an Earth-like temperature. Formula shows that, too. Radius of habitable zone grows as the square root of star's luminosity, if all else is equal. But intensity of solar radiation drops as inverse distance squared. So if you quadruple the star's luminosity, the habitable zone shifts 2 times farther out, where intensity of sunlight was quadrupled from being 4 times weaker. some question i have: there is possibilty of more than 4 forces of nuture? maybe like fifth force we didnt discovered yet? 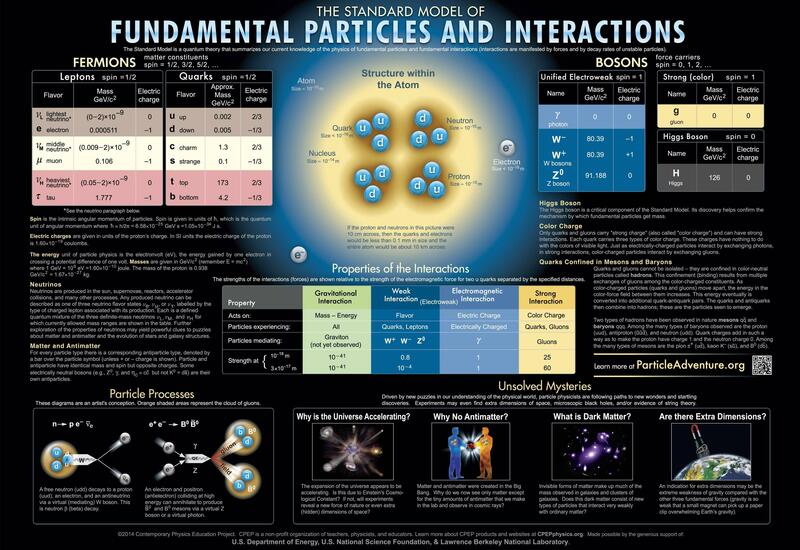 today i learned on my own about the small particles world with bosons, Fermions and Leptons. and i am really curios about that small particles world. and other question: i just find out that there is anti electron. positron. with +1 charge. everything i learned so far is the normal -1 electron. where and when does that positron exist? Dark matter and Dark energy as 5th force? This is certainly possible, but if so then they must exist under very extreme conditions far from what we can currently test. For example, gravitation and electromagnetism are every-day phenomena that we are very familiar with. Strong and weak nuclear forces, on the other hand, operate on the subatomic scale. At very high energies, forces begin to unify, like the electromagnetic and weak force becoming the electroweak force. A large branch of theoretical physics seeks to unify all the forces at greater energies -- grand unification theories. Maybe new kinds of interactions or unification happen very close to the Big Bang, or deep inside of black holes. There are lots of antiparticles. Every particle has an antiparticle twin (though some are their own anti-particle, such as photons and gluons). Antiparticles have the same mass and spin, but the opposite charge. Positrons can be made through a process called "pair production", by which a particle and antiparticle are created together. A high energy photon can be split into an electron and positron when passing through a field, like that near an atomic nucleus. Pair production can also occur straight out of the vacuum. Particles and their anti-particle twins can pop into existence out of the vacuum fields, provided that they meet up again and annihilate each other within a span of time given by the uncertainty principle. This is an important process behind the Hawking radiation. steeljaw354, dark matter is not a new force, but just another kind of matter particle which is weakly interacting except by gravitation. so when the photon split to positron and electron. does the positron is stable as the electron or they both un stable? or only the electron is stable? Positrons can't be used in normal matter chemistry but antimatter can have it's own chemistry, since the particles' charges are exactly opposite --antiprotons have the same charge as our electron while the positron has the same charge as matter's proton, so it is quite possible to have antiatoms and antichemistry, even possibly antibiology and antipeople, however there isn't enough antimatter in the universe for this to occur on it's own and antiprotons are even more rarely naturally made than positrons, so there aren't really any natural antiatoms. Though, the Big Bang produced nearly equal amounts of antimatter and normal matter. (with normal matter having slightly more than antimatter and this is why the great majority of our universe is matter) Had there been more antimatter than matter, things might have happened the same as they have with matter--galaxies, stars, planets, life, people, intelligence all might have come from an antimatter universe, in which case we would call antimatter, matter and vice versa. there is antiprotons? i thought anti matter can happend in the tiny particles world. proton made of 2 up qwarks and 1 down qwarks. so for what i know there could be anti qwark. but what is antiprotons? a proton that made of 3 antiqwarks? antiprotons and positrons around the nuclear? whaaa that cool, its like having lets say anti oxygen? oxygen atom that made of 8 neutrons, 8 antiprotons and 8 positrons? What makes an atom? And what makes that, and what makes that? every neutron or proton is made of quarks. proton is 2 up quarks and 1 down quark. neutron is made of 2 down quarks and 1 up quarks. UP quark has charge of 2\3 and DOWN quark has charge of -1\3. the quarks probably made of strings (the strings theory) that we still dont understand and have prove of it. Yep! They can be created in high energy collisions, and are made of three antiquarks. And it does not stop there. All kinds of composite particles can be made up from antimatter, including atoms. You can have anti-matter chemistry that behaves exactly like regular chemistry. Watsisname, its very cool! to think there is possiblity of anti oxygen that work just like normal oxygen. but antimatter isnt short lifetime and not stable? or they are just like possitive matter but just very very rare and less common? It absolutely can -- it's just very hard to create. Anti-hydrogen has been successfully created and stored for short periods of time, and there have even been some anti-helium nuclei. It just gets increasingly more difficult to produce heavier anti-nuclei, because a lot of things have to come together out of a random high-energy particle collision just right for it to happen. And since heaver anti-particles also require higher energy collisions to make, they come out of the collision with greater velocity and are even harder to confine. Then to make anti-atoms they must also find positrons, but then they are neutral and cannot be confined by electromagnetic field. They will eventually hit the sides of the container and be annihilated. Antimatter and particle physics is really awesome stuff. For a while it's what I was interested in going into as a field of study, before I decided my true calling was astrophysics. You should seriously consider looking into it! 1 thing i still carious about is the quarks colors and the gluons. i know gluons is what make the strong nuclear force. but what about the colors? what does the colors are? what diffrences they have? i think all of that stuff is connected in some way. astrophysics has connection to the sub atomic subject. its all connected in some way, and if your learn astrophysics you can still learn about the sub atomic stuff. good luck with your choice! i am so carious right now that i want to learn everything. astrophysics, astrobiology and sub atomic-forces. its all interesting and connected. Well what makes up the strings? mmm quarks are fundamental particles mean they are not made of! they make stuff! and they make the quarks. so its mean NOTHING make the strings. they are fundamental. they are the ones that make and not made of.